Originally printed in the Philadelphia Inquirer, June 23, 1974. The Road to Ronda starts on the Costa del Sol and winds through the Sierra Blanca mountains for 50 kilometers. That’s about 30 miles. A fast driver can make the trip in just under two hours. The road should never, under any circumstances, be taken when wet. Under normal conditions the trip is a heart stopper. Six-inch high guardrails are placed at random spots to caution the unwary, and occasionally one glances down the thousand-foot drops and sees far below the rusting hulk of some crumpled automobile whose driver just made one mistake. For mile after mile of baking sun, split rock and scrub growth, one sees no houses, no people. It is a journey from the frenetic resort hotel, night club, go-go, ga-ga, ersatz-flamenco-cafe-world of the Costa del Sol– where half the signs are written in German and English, not Spanish, where hawkers hail you off the street and say, “Hey, buddy! Have your name printed on a bullfight poster. Surprise your friends.” Where sound trucks tour the streets of Torremolinos, blaring in English: “If you haven’t seen the Tivoli (a nightclub), you haven’t seen the Costa del Sol!” Where “The Log Cabin” serves pizza and chicken chow mein; and 50,000 arteriosclerotic geezers stroke out along the beach in striped cabanas and Hawaiian trunks, order another Sangria, and sneer back at the 50,000 teenage hippies who are sneering at them — it is a journey from all that, into old Spain Hardly anyone makes the trip.There are two Americans living in Ronda. There is a Moorish castle, the oldest (and the largest) bull ring in Spain, and one first class hotel, The Queen Victoria, price $9 for a double. (Starts at $118 today (2009)). 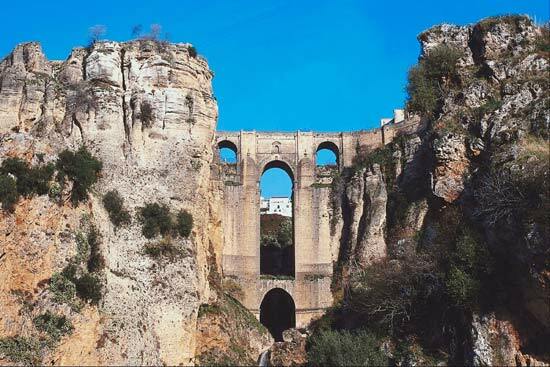 The Victoria sits on a cliff overlooking the long low valley where the Romans encamped on their way to the conquest of Spain– near the old Greek City abandoned when the Moors came later. Where the Catholic monarchs Ferdinand and Isabella, encamped with their army and laid siege to the city because it controlled the western road to Granada, there where the Sultan, Grand Viceroy of the Caliph of Bagdad, sat in the Alhambra and was. for a few moments yet, lord of all he surveyed. Pepe, the concierge, remembers preparing a room and laying out a suit each September when Hemingway returned to Ronda to attend the commemorative bullfight. The art of the bullfight was developed here, by Pedro Romero at the end of the 18th century, and just before the bullfight he would join with friends in the terraced gardens of the hotel and they would walk down the street to the building where he would take his seat in the president’s box. Many of the Spanish nobility would be there and most of the great toreadors; it is an event of much honor. 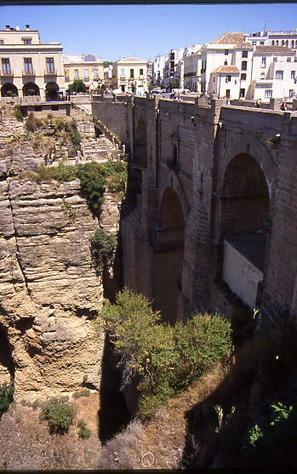 Ronda has been a resort for the Spanish nobility for centuries. Many have palaces in the city. At an altitude of 2,400 feet the city is pleasant even in the hottest days of summer, and the nights are always cool. The air is clear and clean and pours into the lungs’ breath, giving you a desire to walk endlessly through the streets and valleys and mountains around the city. Of the two Americans who live there now, one is a painter named Sargent and the other a New York banker named Rosenberg, who is currently the talk of the town because he bought up a whole street and built a wall at the end of it so the gypsies can not go by his house on their way ot the market. A new and lavish restaurant is being built overlooking the gorge. House prices have doubled in the past few months, driven up by speculators expecting an even higher gain soon. The government is planning to build a new road from the coast, replacing the narrow and dangerous one which is the only link now. There is an air of expectation and anxious chatter in the cafes — Ronda is about to be discovered by tourists. Travel agencies in Germany have already made inquiries with the national tourist board. 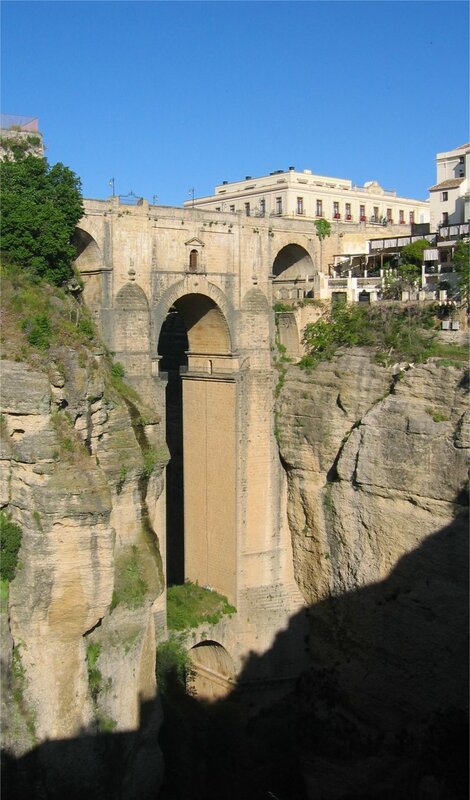 The local travel agencies in Torremolinos and Marbella are promoting side trips to Ronda. At first the tourists will come from the Costa del Sol. Things have gotten bad on the Costa del Sol, and they are going to get worse. There are so many hotels that even the tourist board is no longer sure of the number. Yet for every three that exist now a new one is already under construction. Everyone over the age of 12 seems to have an interest in a condominium syndicate. The “in” crowd favors Marbella now. 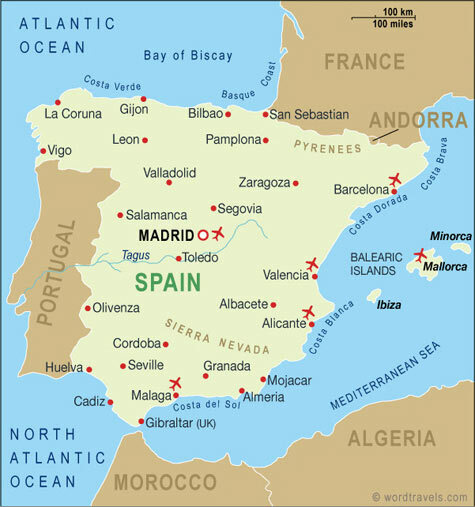 It is only fantastically touristy, instead of Torremolinos, which is incredibly touristy. The starlets and the jet setters and the beautiful people stay at the Don Pepe, $30 a night for a single (around $200 in today’s prices -2009.) 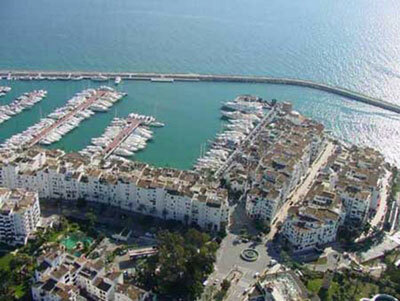 Or, at the other end of the coast, the Sotogrande, near Cadiz: just a notch below is the Hilton. There are local chains, like the Aloha –which seems very strange to see in Spain, until you realize that a kind of international hotel language has sprung up, and place no longer really matters. The hotels are their own resorts. Guests swim in the hotel pool, play tennis on the hotel courts, eat and drink in the hotel restaurants and bars, and take the hotel sightseeing buses in the afternoons. After two weeks of this they go home and tell their neighbors about Spain. This is not theory, it is practice; the hotels, many of them having intimate associations with large travel booking agencies or airlines or both, are built on this premise and history has proven them correct. Yet the travel posters do not lie. The beaches do stretch endlessly into the distance. 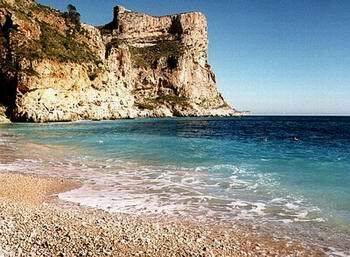 The water is warm and really does lap softly and invitingly against the shore. The sky is an ternal blue bowl and the yellow plains slope up to white mountains in the distance. The breezes are soft and sweet smelling. It is a beautiful land. An estimated 20-30,000 Americans live on the Costa del Sol more or less permanently. Along with them are a nearly equal number of North Europeans — British, Scandinavians and Germans — who take up residence for most of the year. They enter a strange sort of metamorphosis — a kind of life stasis– in which the only reality is the eternal sun baking their brians to rice pudding and the constant squint of attempting to focus on hazy horizons. One is impressed by the great number of English bookstores, in a locale that seems otherwise devoted to the growth and culture of bars. It is because there is nothing else to do. A chance conversation is struck up with an American woman of about 60. She has been living near Marbella for 15 years. Like nearly all other American residents in Spain, she speaks no Spanish. Her first question is in line with what you are soon asked by other expatriates: “Do you have any paperback mystery novels with you?” When the answer was no, she gives a sigh of despair, loses interest, and stares into the distance again. At the other end of the age spectrum a different symptom of the same disease manifests itself. A young man from New Orleans is met in a sidewalk cafe, meticulously arranging precise squares of empty San Miguel beer bottles. “New Orleans, hug? Hey man, watch ya doing here,” I say, dropping easily into the local patois. Nine hours later, walking by the same sidewalk cafe, the same guy from New Orleans is sitting at the same table, the careful squares of beer bottles now extending outwards, something like a man made coral reef, into other, neighboring tables. “Hey, man. How’s it going?” I ask. golden-brown beach, the lapping surf, the clear cloudless sky, the limp half-naked bodies of draped heavies and lithe beautiful young girls with carefully ironed hair — all equally suffering through the final stages of terminal ennui– and smiles contentedly.